Advertising Does your company have a sales program? Sales methods have changed over the years. I remember the door-to-door salesmen selling vacuum cleaners, encyclopedias and household products. Direct-mail promotions and telephone solicitation replaced some of the premise sales calls, but personal contact has always been the best way to present a product, or service and get an order. Industrial and business sales still rely on customer contact to maintain customer relationships. With the popularity of the Internet, many sales are now conducted on-line without any personal contact whatsoever. However, traditional contact and follow-up methods are still the best technique to up-sell and close a sale. A marketer has no control on Internet transactions. Customers either order or they don’t. If you had direct contact, you might be able to talk a potential prospect into buying, or increase the sale with options and accessories. How do you get customers? Print media (Magazines, Directories, Tabloids) still remain one of the best sources to reach new customers in specialty markets. You can’t Google it if you don’t know it exists. Let’s say an individual is an off road Jeeping enthusiast, they will read Off Road and Jeep magazines because they appeal to their special interest. In addition to reading the articles, they will want to know about new products, and will be exposed to the ads. When they find something that they are interested in and want to know more, they may call the advertiser for more information or log on to the advertisers’ web site. The marketer receives a call or inquiries on their website. This becomes both a blessing and challenge. You get a contact How do you handle it? Unfortunately, many companies do not have a comprehensive sales presentation and just send out a catalog, brochure and wait for the prospect to order. Some marketers will follow-up with a phone call, usually a “Did you get the information that we sent you? ” This is no way to sell! There are “salesmen” and there are “order takers”. An order taker is just that! They take orders for those who want to buy, but don’t actually sell by offering options, suggestions or recommendations. A sales professional will find the customers’ needs and interests. They will ask questions and use those answers to present the products features and benefits specifically to fit the customers’ needs. They will overcome objections and ultimately ask for the order. A real salesperson utilizes a combination of product knowledge and experience to build a rapport with the potential buyer. Inquiries are potential sales are you going to sell ’em or just take orders? Does your company have a sales program? 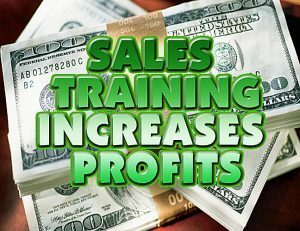 Are you employees trained in Sales Techniques? You might consider engaging a professional to develop a sales program and provide training for your telephone and counter staff. That program should include setting up a database, for prospect entry and tracking, and follow-up, plus developing a sales script outlining on key FAQ’s with responses to objections along with a “close”. Periodic sales meetings review customer input and update the sales pitch. This is developed and managed by a professional marketing consultant experienced in sales. Onsite Sales Training Programs are customized for each client and industry and available by contacting: Tom Smisek Marketing Consultants, Orange County California. advertising, Customer service, E-commerce, Orange County California, sales promotion. Bookmark.